When is the Best Time to Have Pool Fencing Installed? Plan for new pool fencing today so it’s ready to go when the summer starts! The cool breezes of spring are on their way and the warm summer nights won’t be far behind. As you start to daydream about opening your pool for the season, it’s time to plan when you’ll install or update your pool fencing. While the weather outside seems unforgiving right now, it’s never too early to start planning! 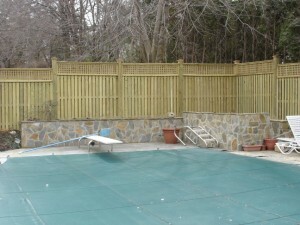 When is the best time of year to have your new pool fencing installed? Before you can schedule the installation, you need to plan your pool fencing out. What type of pool do you want? What type of pool do you already have? In Maryland, it is actually illegal to build or install a pool without pool fencing, so the design of your pool will directly influence the design of your pool fencing. The state requires that your pool fencing be at least 4 feet high and include gates that lock. The regulations are there to protect children and pets from accidentally wandering into the pool area unsupervised and having any accidents happen. Once everything else is installed, your pool fencing will be installed. They are the very last parts of the process, so make sure that you are all done. You can receive final pool permit approval once the fence is installed and inspected by the local regulatory body. In order to ensure your pool will open when you want it to, give Hercules Fence Northern Virginia a call at the start of the installation process. If you wait too long, you might be waiting with many other homeowners to get fencing permits and then get on the installation schedule. This entry was posted on Friday, March 3rd, 2017 at 5:28 pm. Both comments and pings are currently closed.